But before I continue, I wanted to give a reason why I posted an all-day-long-running-live-countdown today on my blog. It is because I received a great achievement on my blog last Monday. 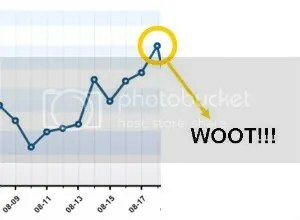 I don’t really care about site traffic but wth, I got an achievement of 852 views!!! Yipee!!! *faints*… *goes back to poise again* That was really something to me. I’m glad that many people cares ^_^!!! God Bless ~>.<~ And now, to show my appreciation, I’m giving y’all a live countdown by moi!!! Now let’s continue on to the On-Deck songs. These are the songs which haven’t made it to the main Top 20 but they are still worth mentioning since they are all great OPs. – This is a legend when it comes to OP sequences so I’ll be giving chances to others on the chart. – It has a nice feeling that it gives you to start off the series. It is like you are ‘imprisoned’ while listening to it. – Vic Mignognahas a smexxy voice!!! Kyaa~! – FLOW’s strong vocals and the pleasant tune of the song makes this one of my favorite OP themes. – LOL. I don’t expect to put on some ALI Project songs here but I think this is the one that is the most fitting for a show. It suits the Gothic motif of Rozen Maiden. – When we’re talking about MOE and EPIC-ness of OP sequences, Lucky Star’s Motteke Serafuku never fails with its addictive dance and wacky video. Evangelion is already ‘d best’ so it would be nice if you put it aside. OH GOD NIGHTMARE OP MAKES ME WANT TO DAKISHIMETE ENMA.